Watch this short video to see how organizations of all types can escape the constraints of file based data sharing tools with Snowflake Secure Data Sharing. By enabling anyone you wish to securely access your data (instead of transmitting it to them), you can save time, resources, and significantly reduce the burden of data sharing on your customers. Hear the vision for Secure Data Sharing directly from Snowflake CEO Bob Muglia, and see how companies are already using Secure Data Sharing to transform their business and create new ones. With Snowflake’s Secure Data Sharing Snagajob can share data with its enterprise customers that want to perform analytics on their sourcing and hiring activities. Snowflake Secure Data Sharing is by far the simplest method for sharing data between organizations. Take an in-depth look at how Secure Data Sharing works in this solution brief, and see how other organizations are taking advantage of sharing data today. 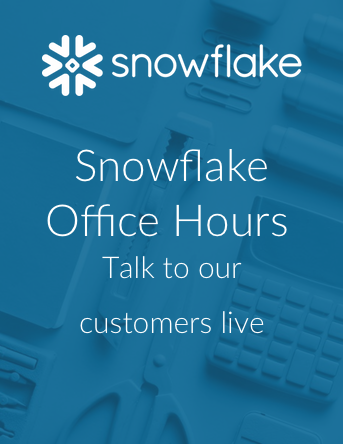 Hear from Snowflake’s Data Sharing Product Manager, Shekhar Bapat, as he goes into detail on the architecture and functionality behind Snowflake Secure Data Sharing. You’ll even get a chance to see data sharing in action during a live demo. Data has always been at the heart of the modern enterprise, but sharing data has traditionally been difficult. Read this eBook to see what a modern data warehouse, with the extension of data sharing capabilities, would look like.